At Eye of the Fish, we feature the big issues concerning Wellington. Like the Film Museum, the Basin Bridge, and ummm, others. We leave other mildly successful blogs like Transport Blog to discuss things like Auckland’s Unitary Plan, or their city’s woeful transport problems involving $2 billion worth of rail tunnels, while we discuss the smaller, more important things in life. Like the corner of Cuba St and Abel Smith St. Yes, it’s a problem at times, because it is confusing. It has 4 stop signs, and no predominant direction of traffic flow – although I always use it only east-west to go to and from the Southern Cross pub, and therefore mainly on foot. Others (I find, somewhat bizarrely) use it by car, up and down Cuba St. I mean – who even does that? 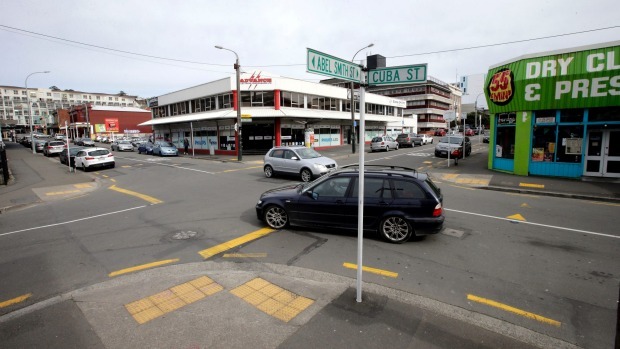 Who drives up Wellington’s most pedestrian route? Why? It’s also a problem because no one knows the rules governing a four-way Stop, or indeed, if they do know them, then the issue is more that: no one obeys the rules governing a four-way Stop. It is actually pretty simple really: Stop. That means all 4 wheels at rest, in contact with the ground, for a period of time. But no one does that, with car drivers instead performing what they optimistically call a “rolling stop” which is actually not a stop at all. It’s just driving through the intersection and slowing down a bit. It’s like a Drive By shooting, but without guns, but just as effective at scaring the pedestrians. After you have stopped, then there are complicated rules like give way to your right, or to someone going straight ahead if you’re turning, or give way to pedestrians some times if you’re not in too much of a hurry. But actually, the rule that governs this, to me, is: Who got there first? If they stopped, and they were there first, then they get to go first. They’re indicating already, right? But mostly, they’re not indicating, as most people using this intersection are going straight. Mostly. Things might be different if we had 2 Stop signs and 2 Give Way signs. Or might be more honest if we just had 4 Give Way signs, but then we would just be back to square one, of drivers not knowing who should go first. Instead, because of a petition by a group of disabled students, we have a proposal for $200,000 worth of traffic lights. Admirable because of the kids, who understandably feel frightened by all the rolling-stop / drive-by action. But not admirable for the rest of us, who I suspect really don’t want or need another set of traffic lights. Us pedestrians are just going to ignore the lights as we do every other set of lights in Wellington. And cars tend to speed up when they see a traffic light, just in case it be changing colour when they get too close. See green, go faster in case it turns orange. See orange, go faster in case it turns red. See red, go faster just in case it be turning green again real soon. For pedestrians it is not a good thing. So here is a proposal or two. One: police the intersection and give out tickets to people who don’t stop. Two: police the intersection and give out tickets to people who don’t indicate. Three: hold on, we are on Cuba St, and the last thing we want is lots of cops hanging around eating our Ekim Burgers instead of their normal doughnuts. Four: here’s a thought: raised kerbs and footpaths like the WCC has done on Taranaki and Tory St, to the little side streets like Haining St and Frederick St. They’re a pain in the arse to drive over, which should help to slow down or even reduce the traffic, but they do give the pedestrians a more confident route across the intersection. Five: so, would that be north-south raised footpaths following Cuba, like most people do, or east-west following the route from Fidels to the Cross, like the Fish does? ho ho ho. Don’t even mention the thought out loud! Very sad to see it go. I like that the cars all have to stop and always found it easy to cross as a pedestrian as the cars are not speeding through. All it needs is a four way crosswalk like Hataitai to make it even better. Except traffic engineers seem to hate those. Too much delay for motorists maybe? I quite agree. Traffic lights is an overkill, and are unwanted by the local pedestrians. I love the 4 way stop! It does exactly what it is supposed to, slow everyone down and get them to think about their next move. I would vote for a mayoral candidate that is in favor of more of this progressive traffic engineering. Or doe we need 4 lanes to cuba as well? I found another 4-way stop today in Petone. Works even better, due to low traffic volumes. The thought of the typical boring wait for traffic lights to change at that intersection before getting authorisation to cross fills me with rage/terror/pissed-off-ness – it is just so unnecessary! All being done because a bunch of disabled kids started a petition, which is admirable, but the solution is just the wrong one! Mr Foster – can we get you to rethink this one please? This is the second move in recent weeks from WCC traffic engineers that is very pedestrian unfriendly. The other is the replacing the zebra crossing across the cable street slipway on the oriental bay corner with a push and wait set of lights…. Traffic lights, as long as all the pedestrian lights are set to “cross” all the time.